Working remotely is the best, especially if you can successfully score yourself a free trip to Hawaii to do it. But working remotely from a Major League Baseball game while eating free food and sipping free beer? That's the American dream, people. And if you live in Denver, it could easily be yours, thanks to a new deal from the Colorado Rockies' called the Business Person Special. The $21 ticket comes with standing-room view of the game, a burger, beer or soda, WiFi, and a special ledge just big enough to perch your laptop. Beats the hell out of keeping the game open in another tab while you're the office. The special combo, which debuted this season and is available only during select weekday games, caters to people who may or may not care to do actual business while catching a game. Plugging away on a laptop in a stadium for nine innings may not seem like something a true fan might do, but working while watching is sort of a perfect combo. After all, baseball games can drag on and on (and on), so catching up on emails or looking over a proposal during the intermittent lulls isn't the worst way to spend your time. 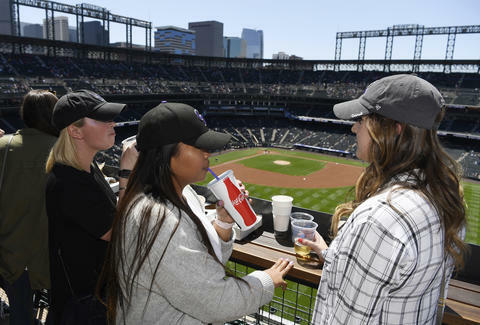 During a recent game, The Denver Post sent a writer to scope out the scene at the section of Coors Field where the so-called Business Persons hang, and he didn't spot a single other ticket-holder there with their laptop out. He also realized the sun's glare on the computer screen made getting much done pretty tough, and that rampant beer spillage and expensive electronics are a recipe for disaster. Still, even if no one's getting down to actual business using the Business Person special, you can't argue with $21 for a burger, fries, beer, and a decent view of a big league game. That is a crazy-good deal. Hope you're taking notes, every other ballpark in America.